Advance Tickets are $10 (+ tax). We have announced the final name from the ART in the DARK Reloaded + Rebranded campaign! 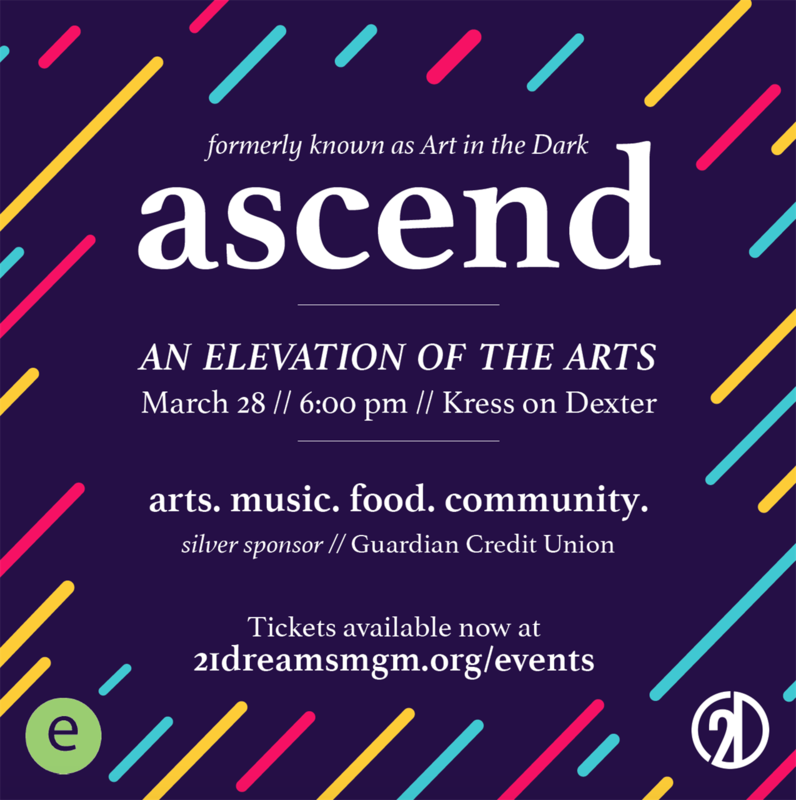 Ascend // Elevation of the Arts // March 28 // 6pm at Kress on Dexter. Join us for an evening of creative arts, music, food & refreshments with our community partners in the heart in downtown Montgomery! We bring together the traditional elements of Art in the Dark by featuring several River Region galleries: Montgomery Art Guild (MAG), SAC's Gallery, Prattauga Art Guild (PAG), Expose Art, 21 Dreams, etc., immersed in the sights and sounds of Gravity (DJ Collective). Also extending the opportunity to be one of the faces of the "INSIDE OUT - We Are The Dream" public art project by MAP. Be sure to come ready to have your expressive photo taken in the photo lab! We're excited about the developments! More details unfolding. Lock in your spot now! $10.00 (+ tax) limited time advance tickets. + Emerge Montgomery and KHARI. All net profits will directly back to supporting the mission 21 Dreams, a 501(c)(3) nonprofit community arts organization. Our Mission is to influence growth and value of the arts through public engagement and creative programming ensuring accessibility for all.